The Congressional Black Caucus Foundation was awarded more than $500,000 in taxpayer-funded government grants since 2010, records show. Seven of its leaders additionally paid themselves six-figure salaries, according to the group's most recent tax filings. The CBC Foundation, a nonprofit that is separate from the Congressional Black Caucus, carries a mission of advancing "the global black community by developing leaders, informing policy, and educating the public." 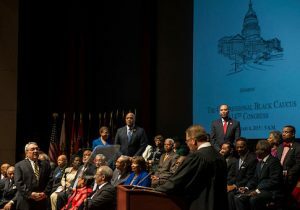 Despite its separation from the Congressional Black Caucus, a number of members sit on its board of directors. These representatives include Sheila Jackson Lee (D., Texas), who chairs the group, Keith Ellison (D., Minn.), Hank Johnson (D., Ga.), Emanuel Cleaver (D., Mo. ), Alcee Hastings (D., Fla.), Gwen Moore (D., Wis.), Terri Sewell (D., Ala.), and Brenda Lawrence (D., Mich.). Individuals from major corporations also have a spot on the group's board. Lonnie Johnson, who serves as counsel at Exxon Mobil, Earle Jones, the senior director of governmental affairs at Comcast, and Emmett Vaughn, the director of the diverse business empowerment office at Exelon, one of the nation's largest electric companies, all have a place on the board. The group strives to achieve their goals by facilitating the exchange of ideas and information to address issues affecting the black community, providing leadership development and scholarship opportunities to educate "the next generation of leaders," promoting public health and financial empowerment, and developing strategic research and historical resources for the public, according to their website. The foundation has been aided by hundreds of thousands in federal funding through government grants and contracts that all came during President Barack Obama's tenure. The foundation received its first federal grant in 2010 from the Department of Health and Human Services for $120,000. In 2011, the group pulled in an additional $120,000 in grants. In 2012, $119,774 was given to the foundation. In 2013 and 2014, the foundation received a total of $226,638 from the government. The group was also awarded tens of thousands more in government contracts in addition to the grants, according to data from USASpending.gov. The last available Form 990 from the foundation shows that $1,014,142 of the foundation's expenditures went towards salaries with seven employees pulling in more than six figures. Shuanise Washington, the foundation's president and chief executive officer, pocketed $260,000 in 2014. Samuel Rodriguez, the senior director of finance and administration, received $133,539. Tasha Cole, the vice president of research development, and Shirta Sterlin, the vice president of communications and marketing, both were paid $126,500. Majorie Innocent, the vice president of research and programs, earned $125,363. Sharon Holloway, the senior director of human resources, made $121,658 while Krisa Haggins, the vice president of external affairs, hauled in $120,582. That same year, the foundation handed out 323 scholarships totaling $600,841. Seventy-three recipients received stipends of $277,025. The foundation gave $25,000 to other foundations. The foundation did not return requests for comments by press time.